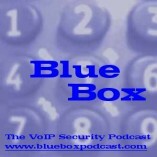 Welcome to Blue Box: The VoIP Security Podcast #71, a 51-minute podcast from Dan York and Jonathan Zar covering VoIP security news, comments and opinions. NOTE: This show was recorded on November 8, 2007. Mark Collier: VoIP Training Courses – he also has made available his presentation on security that he recently gave at AT&T’s Focus Conference. Comments, suggestions and feedback are welcome either as replies to this post or via e-mail to blueboxpodcast@gmail.com. Audio comments sent as attached MP3 files are definitely welcome and will be played in future shows. You may also call the listener comment line at either +1-206-350-7280 or via SIP to 'bluebox@voipuser.org' to leave a comment there.